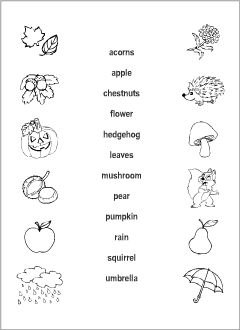 Here, in one place, you can browse, download and print worksheets designed for learning and practising English words related to the theme Autumn: acorns, apple, chestnuts, chrysanthemum, hedgehog, leaves, pear, rain, squirrel, umbrella. Scroll down to explore! Choose from five different types of worksheets designed to learn and practise English vocabulary related to the theme Autumn. 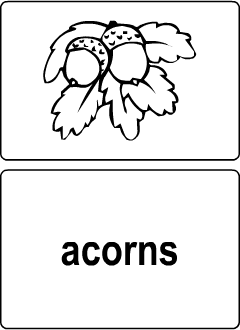 There are ten vocabulary words that appear in our printable Autumn word games: acorns, apple, chestnuts, chrysanthemum, hedgehog, leaves, pear, rain, squirrel, umbrella. 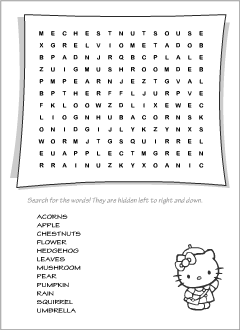 Choose from five different types of worksheets designed to consolidate and revise English vocabulary related to the theme Autumn. 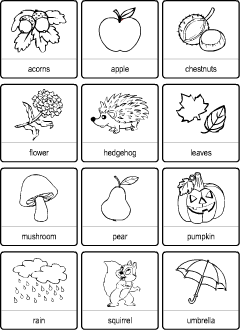 There are ten vocabulary words that appear in our printable Autumn tests and quizzes: acorns, apple, chestnuts, chrysanthemum, hedgehog, leaves, pear, rain, squirrel, umbrella.